James Bond (Roger Moore, The Naked Face), the man with the licence to kill, finds out that there is a price on his head. It seems that someone has hired the world’s greatest hit-man, Francisco Scaramanga (Christopher Lee, Horror of Dracula), to kill him. Bond and a clunky, but beautiful agent, Mary Goodnight (Britt Ekland, Get Carter), set out to find the dangerous Scaramanga before he finds them. If Live and Let Die (1973), Bond #8, drew its inspiration from the blaxploitation movement, The Man with the Golden Gun rides on the coattails of the kung fu craze of the 1970s. The franchise always knows how to exploit a current trend, and the film reflects the appetite for all things Asian. It’s an improvement over the previous movie, which was lacking in some areas. 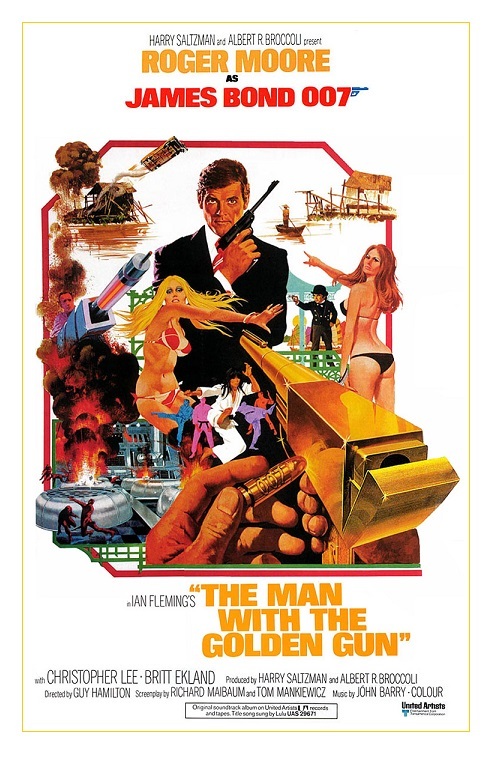 The Man with the Golden Gun, written by Richard Maibaum and Tom Mankiewicz (Superman:The Movie), directed by Bond veteran Guy Hamilton (Goldfinger and Diamonds Are Forever), has some fine action sequences, most notable an all out martial arts mad-fight that is just so much fun to watch! There is, however, some annoying recycling here. A boat chase is almost identical to the one in Live and Let Die and Sheriff J. W. Pepper (Clifton James, Superman II), the bumbling hick from the previous movie, makes a cameo appearance. I didn’t mind this character as much as other viewers, but he really doesn’t belong here — it struck me as just plain lazy writing. I liked the idea of self-reflection, but naturally, this kind of introspective approach doesn’t lend itself to exciting adventures and the movie tends to be a bit slower than your average Bond movie. I think this is the reason the movie ranks low among fans of the franchise (it’s one of the lowest-grossing films in the series). Christopher Lee, who was Ian Fleming’s cousin and at some point was considered for the role of Dr. No, gives one of the best performances in a Bond movie — he’s a class act. Hervé Villechaize (Tattoo in the TV series Fantasy Island) is a lot of fun as Scaramanga’s diminutive, but deadly henchman. The ladies are on the weak side — Britt Ekland and Maud Adams (Rollerball), who plays Scaramanga’s girlfriend, are just okay. The title song is performed by Scottish singer Lulu (“To Sir with Love”). Most people don’t like the song. It’s a naughty, naughty song filled with sexual innuendos and I thought Lulu did a great job. Interestingly, American singer-songwriter Alice Cooper was hired to do the song, but his version was rejected by producers Harry Saltzman (this is his last Bond movie) and Albert R. Broccoli. Lukewarm box-office returns (for a Bond movie) and behind-the-scenes drama, nearly made The Man with the Golden Gun the last 007 adventure. The film does have some flaws, but it remains one of the most interesting if less admired films in the franchise — it’s one of my favorite Moore/Bond movies! Color, 125 minutes, Rated PG.